Two (well, okay, five) new coins are making the news recently, at least in part because of the heraldry contained on them. First, from Denmark, a new coin (1,000 kroner) has been designed to celebrate the 70th birthday of Queen Margrethe II of Denmark. 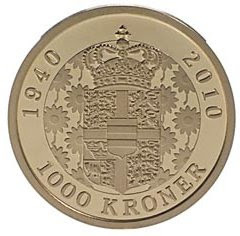 The reverse was designed by young, but extremely talented, heraldic artist Ronny Andersen. The flowers around the Royal arms are daisies, marguerites, a personal and informal symbol of the Queen, making this design a pleasing combination of official and personal. Next, from England, we have a new, well, okay, four new, £1 coins. The first has already appeared (see image above), another will come out later this year, and the remaining two will be minted next year. What the four coins of this series have in common are the arms of the four capital cities of England, Wales, Scotland, and Northern Ireland (London, Cardiff, Edinburgh, and Belfast, respectively), with each coat of arms being emphasized in one of the four issues. 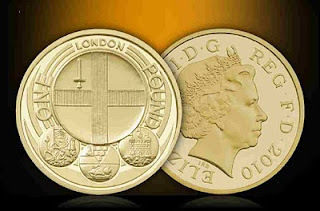 Designer Stuart Devlin has given the designs a contemporary flavor by making the shields round to reflect the shapes of the coins themselves. It is such a pleasure to see armory being used in these coins.